Cincinnati Real Estate on the Rise! *Information provided by the Cincinnati Area Board of Realtors and Greater Cincinnati MLS. The Spring selling market is in full swing in the Cincinnati and Northern Kentucky area. Even with the coldest weather we have had in decades, home sales continue to gain momentum for this time of year. 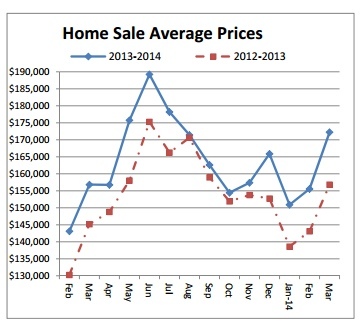 The average sale price for homes in March of 2014 increased by 9.7% compared to the average sale price in March 2013. Interest rates appear to be stable, with local mortgage rates in March averaging 4.45% for a 30 year fixed rate loan. These rates are still at a level that make purchasing a home very affordable. Cincinnati was recently ranked #9 by Forbes magazine for being “One of America’s Best Cities for Raising a Family.” We are proud that we have one of the lowest costs of living among America’s largest metros. We live and work in a stable market with affordable housing opportunities. So whether you are buying your first home, making a move-up, or relocating to the Cincinnati area, contact the Finn Team to guide your through your home search or sale. ← Freshen up your home for Spring!